Latest budget papers, just released by the Gujarat government in the state assembly, have revealed that, much against the claims of “double digit rate of growth”, Gujarat's gross state domestic product (GSDP) at constant prices (calculated by deducting inflation) rose by 8.76 per cent in the year financial year 2013-14, and is unlikely cross the 7 per cent mark in 2014-15. 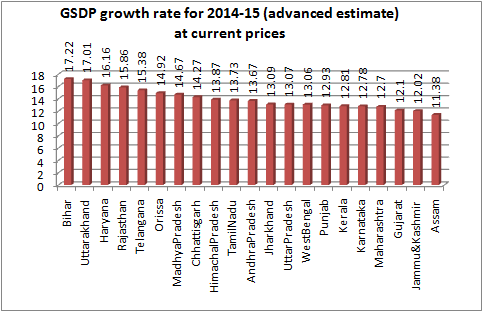 At current prices (without deducting inflation), they suggest, state's growth rate is one of the poorest in India, putting a question mark of Gujarat being India's growth engine. What should particularly make the industry-friendly policy makers worried is, this was the third consecutive year that Gujarat's growth rate was in the single digit – the Socio-Economic Review, one of the budget papers, says that in 2011-12 the GSDP grew by 6.1 per cent, and in 2012-13 it grew by 6.7 per cent. Interesting though it may seem, this is against the Government of India's estimate of GSDP rate of 7.66 per cent for 2011-12 and 7.96 per cent for 2012-13, respectively. What should be a matter of further concern for the state policy makers, who only recently held one of the biggest industrial shows ever in India, Vibrant Gujarat Global Investors' Summit (January 11-12, 2015) with Prime Minister Narendra Modi blessing it, is that advanced estimates (AE) of the Gujarat government suggest, in the current financial year, 2014-15, Gujarat's growth rate is likely to be again in the single digit, and worse than the previous year. 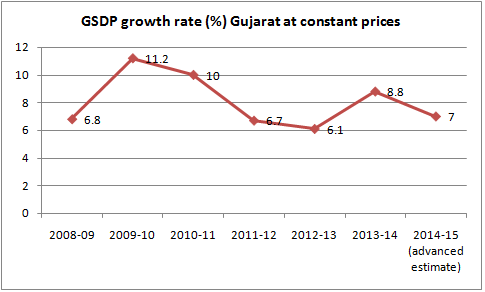 This is clear from the Gujarat government's fiscal responsibility statement, which shows that the state's growth rate at current prices (without deducting inflation) would be 12.1 per cent, as against 16.3 per cent in 2012-13, 10 per cent in 2011-12, and 14.8 per cent in 2011-12. Experts have calculated that, if one deduces the rate of inflation in order to arrive at a constant rate GSDP growth rate, Gujarat's real growth rate would be around 7 per cent. The document goes on to say, “The state economy at current prices has recorded an annualized growth rate of 15.49% for the last eleven years (2004-05 to 2014-15), one of the highest in the country demonstrating the sustained trajectory.” However, even at current prices, the state document does not provide any inter-state comparison to suggest whether this is true. A comparison of the current price growth rate for 2014-15, as found reflected in state budget documents (12.1 per cent) with the data of growth rate provided by the latest Government of India's 14th Finance Commission document suggest that Gujarat has performed worse than all major Indian states, except two -- Assam and Jammu & Kashmir. State-wise figures – Andhra Pradesh (13.67 per cent), Bihar (17.22 per cent), Chhattisgarh (14.24 per cent), Haryana (16.16 per cent), Jharkhand (13.09 per cent), Karnataka (12.78 per cent), Kerala (12.81 per cent), Madhya Pradesh (14.67 per cent), Maharashtra (12.70 per cent), Odisha (14.92 per cent), Punjab (12.93 per cent), Rajasthan (15.86 per cent), Tamil Nadu (13.73 per cent), Telangana (15.38 per cent), Uttar Pradesh (13.07 per cent), Uttarakhand (17.01 per cent), and West Bengal (13.06 per cent). The 14th Finance Commission documents puts Gujarat's growth rate at 13.63 per cent -- and, if one takes this figure as correct, even then as many as 11 states perform better in 2014-15.